Be the first to share your favorite memory, photo or story of Rev. George. This memorial page is dedicated for family, friends and future generations to celebrate the life of their loved one. Rev. 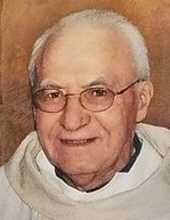 George P. McKenna, Age 99, a Catholic priest for 75 years in the Archdiocese of Chicago, born into eternal life on January 25, 2019. Beloved son of the late Patrick and Mary O’Malley McKenna. Loving brother of the late Catherine (Frank) McGlynn, John (Kay) McKenna, and Frank (Anne) McKenna. Cherished uncle, grand uncle and great grand uncle to many nieces and nephews. Fr. George was a graduate of St. Theodore Grammar School, Quigley Seminary North, and St. Mary of the Lake Seminary. He was ordained on May 6, 1944 by Samuel Cardinal Stritch and faithfully served the Archdiocese of Chicago for 75 years. His assignments included: Maryville Academy (1944-1949), Teacher at Quigley Seminary North and South (1949-1968), Christ the King (1963-1968), Pastor of St. Barnabas Parish (1970-1976), Missionary at Fairbanks Diocese in Northern Alaska (1976-1977), Pastor of St. Catherine of Alexandria (1978-1982), Associate Pastor of Our Lady of Snows (1982-1989). He was the Proud Founder and Chaplain of the Chicago Midway Airport Chapel (1988-2011). Jerusalem captured his heart and he pilgrimaged to the Holy Land 27 times over the years. Fr. George is fondly remembered as the author of four books on the “3-Minute Homily,” publisher of his personal blog “God is Good” that reached 147 countries, and for his exceptional golf skills that made him 8-time champion at the Chicago Clergy Annual Tournament. Lying-in-State on Thursday, January 31st from 2:00pm-8:00pm and Friday morning, February 1st, from 10:00am-11:00am, at St. Barnabas Church, 10134 S. Longwood Dr. Chicago, IL 60643. Liturgical Wake Service Thursday evening at 7:00pm. Concelebrated Mass of Christian Burial on Friday at 11:00am. To send flowers or a remembrance gift to the family of Rev. George P. McKenna, please visit our Tribute Store. "Email Address" would like to share the life celebration of Rev. George P. McKenna. Click on the "link" to go to share a favorite memory or leave a condolence message for the family.